Northwestern alumni Patrick G. Ryan (Kellogg ’59) and Shirley W. Ryan (Weinberg ’61) donated $25 million to the university on Tuesday, partly to facilitate the creation of endowed professorships at NU. The gift brings the Ryan family’s total contribution to NU up to nearly $200 million. Ten million dollars of the donation will fund the Ryan Family Chair Challenge, which will match the contributions of other donors toward establishing new endowed chairs across a range of disciplines. The remaining $15 million have yet to be designated. According to the news release, fewer than 500 of NU’s 3,300 full-time faculty hold endowed chairs. Endowed professorships are critical in attracting and retaining top faculty, University Provost Daniel Linzer said in the news release. Currently, the endowed chairs are planned for several areas across disciplines, including biomedical sciences, media and global health. These chairs provide funds for research, as well as stipends for student and postdoctoral researchers. “Endowed professorships allow work in uncharted territory, giving faculty a stable foundation from which to pioneer new projects, riskier projects, in new and emerging fields,” said Jan Eberly, James R. and Helen D. Russell Distinguished Professor of Finance at the Kellogg School of Management in the news release. As part of NU’s “We Will” Campaign, a multibillion dollar fundraising campaign, the gift brings the Ryans’ total campaign contributions to more than $100 million. The newly built Music and Communication Building on the Lakefill was dedicated to honor the charitable donations of Patrick G. Ryan and Shirley W. Ryan to NU. 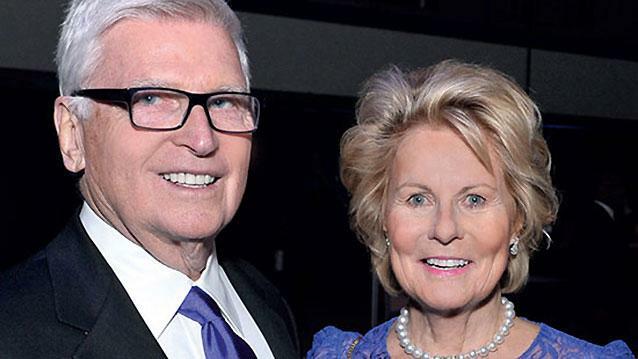 “The unprecedented generosity of Pat and Shirley Ryan has benefited Northwestern in so many ways,” said University President Morton Schapiro in the news release Tuesday. Correction: A previous version of the caption accompanying this story misstated the name of one of the donors. His name is Patrick G. Ryan. The Daily regrets the error.